Enjoy Cuban culture and get to know her people up close and personal. The following people-to-people activities in Cuba provide meaningful, intriguing, and memorable opportunities for exchanges in both Ciego de Ávila and Havana. Itineraries are subject to change based on availability. Note: There is a $300 additional fee for these activities for one-week volunteers. One-week volunteers on Ciego de Ávila programs do not visit Havana. 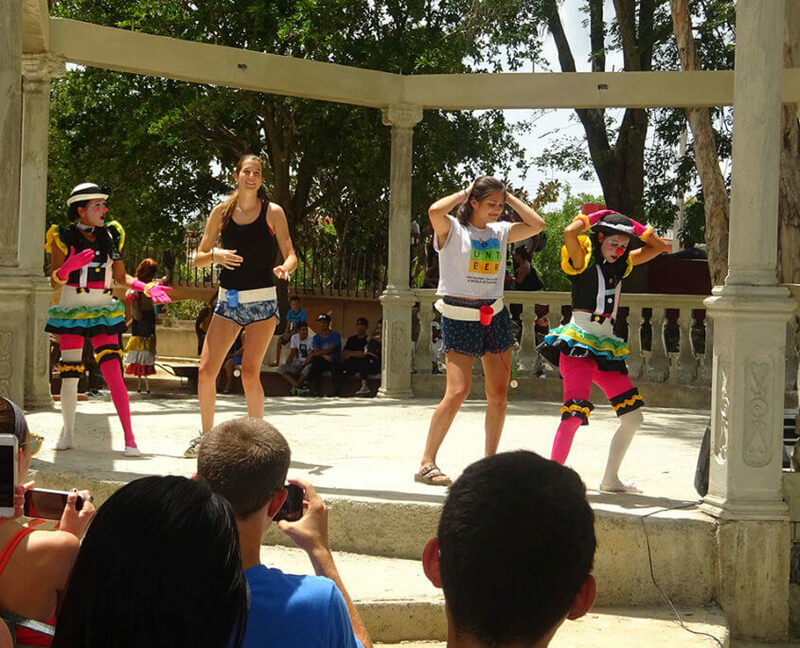 Two-week volunteers in Ciego de Ávila enjoy people-to-people activities both in and around Ciego de Ávila over the middle weekend and the last two days of the second week in Havana. The people-to-people costs are included in the two-week program contribution. Learn the language of this Caribbean dance from local instructors. Move to the music or watch from the sidelines—but beware, the music is hard to resist. The following are only a few people-to-people activities in Cuba offered by Global Volunteers. This professional theater company has won multiple awards for acting, design, and staging, including Cuba’s 2015 Community Culture Award. As a community theater, it presents unique performances on stage and in the streets, parks, and plazas. Volunteers learn about the history and the work of the theater group, converse with the artists and enjoy a high-quality show. Explore the history of our host community from its colonial foundations through the revolution and today. A vibrant alfresco music house—tap your toes or practice those salsa skills. A national poet of Cuba, Nicolás Guillén was a 20th century journalist, political activist, and writer. The foundation was formed by local residents, Larry and Lena, who invite you into their back yard patio to learn about Guillén and listen to wonderful Cuban jazz. Visit a shop where artisans create incredible sculptures with vintage silverware (Oh, which one to buy and take home? ), peek inside a cigar factory, and check out the works of a local watercolorist. An introduction to the basics of this global language. A local instructor will run you through key words and phrases. A local art cooperative that transformed a dirty garbage dump into an art loving, creating, and respecting community. Local artists train others, sell their artwork, and speak to visitors about what it means to be an artist in today’s Havana. Hemingway’s estate offers visitors a look into his past, and what his life was like at the time he lived and worked in Havana. Volunteers can walk around his home, see his vintage boat, and enjoy the solitude of the beautiful grounds. Located on the historic Port of Havana, this restored warehouse houses dozens of artisan stalls showcasing paintings, sculptures, guayabera shirts, woodwork, leather items, jewelry, pottery, and traditional handicrafts. A UNESCO World Heritage Site; a must see walking tour through the heart of this historic city. An experienced guide will lead you down cobblestone streets and picturesque tree-lined squares, through an eclectic mix of shops, cafés, monuments, and churches. Pause on a park bench or enjoy a cup of coffee at an outdoor café and soak up all Havana has to offer. Learn about Cuba’s highly effective education system (UNESCO reports Cuba’s literacy rate at 99.7%) from an experienced teacher. Hear a Cuban professor/lawyer describe U.S. – Cuba relations from the Cuban perspective and explain the significance of the Cuban revolution and its place in the country’s history. Enjoy a guided tour of the city in an iconic 1950’s convertible for which Havana is so well known. Housed in the old Presidential Palace, this museum is dedicated to the Cuban Revolution with exhibits that tell the stories of the Castros, Che Guevara, and their contemporaries. Cuban artist José Fuster has transformed an impoverished neighborhood into a whimsical art attraction, featuring thousands of Gaudí-inspired mosaics. Nine days or two weeks allows you numerous people-to-people activities in Cuba. Engage teens and adults in lively English conversations; work alongside local women making crafts to benefit women’s cooperative interests; repair and maintain community civic buildings and equipment; assist with meal preparation for seniors; help farmers plant, weed, and harvest fruits and vegetables; and offer senior support at daycare centers. Cubans and Americans together—building bridges over which our governments can walk.